Ram Gopal Verma killed the hope of best possible optimists that he can ever be trusted again as a director with Officer. He promised to start afresh like ever with Lakshmi’s NTR! Is he really back? Plot: Revealing too much of the plot for a biopic is a disservice. So, we are just stating the obvious. 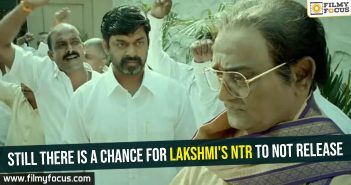 Lakshmi’s NTR is the third part of NTR biopic with different actors by RGV about Lakshmi Parvathi (Yagna Shetty) and her love towards NTR (P. Vijaya Kumar). With CB Naidu (Shri Tej) scheming against the family, the man and the protagonist lady. Performances: P. Vijaya Kumar as NTR is believable but he lacks the charm. You know that an actor is doing the scenes in place of the original person. Even though it seems nitpicky, in a biopic looking like a dream life character with all the charm intact is also must like Mahanati. Yagna Shetty is good in the initial scenes but she is later reduced to a one tone performance and by the end, she just couldn’t do much more than shedding the glycerin tears. Shri Tej as CBN is very good. But he played a caricatured version of the original man. Hence, even though it looks very accurate it doesn’t really feel like watching a character. All others are the same too. Technicalities: Music by Kalyani Malik isn’t great or good. It is pretty average. His instrument selection is good enough but the total impact is nullified by extensive grain noise. Cinematography by Rammy is just the cheapest possible output one can expect from a professional and it lacks any kind of finesse. Editing by Kamal R is one of the worst possible jobs. He couldn’t control the scene length or give it an engaging flow too. The scenes feel like to have been dragged on purpose and they lack any rhythm. Written by Narendra Chari, RGV screenplay seems like a stage play and even the dialogues resonate with the same. Movie characters and their motives just look plain bland like a mere mocumentary on the original incidents that Discovery channel or History channel produces on a regular basis. The last song is even bigger absurd in the entire film. Directed by RGV, Agastya Manju movie fails to capture the seriousness behind the issue as the conversations feel too caricaturistic and not serious at all. Except for scenes that have CBN, all others seem too week and immature. As the scenes don’t really show something that is new or groundbreaking, the promotion that RGV only truth seems to be a marketing gimmick. Also, RGV is no longer the director, he once used to be. Analysis: Ram Gopal Verma tries to give the film a romantic angle as if the entire film is about the love that Lakshmi Parvathi and NTR shared after she met her. The kind of purified form of love angle that he gives to their romance seriously undermines the impact that the movie could create. The conversations are really pale and comic. It is like Meera talking to Lord Krishna, whenever we see NTR and Lakshmi Parvathi come on screen. The movie tries to portray CBN as a negative lead and that intention of the makers seem to be the only purpose of the entire movie, as that part of the story is handled better than other scenes. 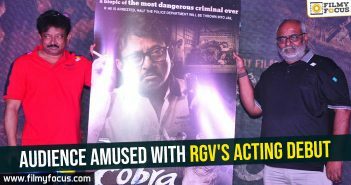 On the whole, RGV’s dramatization of the events is too comic than matured.